Note: This article is a sidebar to this issue's feature story, "On Cancer’s Trail." Between Haystack Rock and Mount Taylor, on an expansive sweep of desert near the eastern edge of the Navajo Reservation, Kerr McGee and Homestake mined uranium ore for decades, hauling it down the road in uncovered trucks. The Homestake Mill is now a Superfund site, the final resting place for 7 million tons of tailings. There might be more to come: Uranium Resources Inc., a Texas-based company, wants to reopen the Ambrosia Lake mine. This time around, though, the company says that the tailings will be "dry" and stored belowground in lined beds. According to locals, the boom around here began when a Navajo named Paddy Martinez walked into a bar in 1950 and set off a Geiger counter. He'd been dozing under a limestone ledge and woke up covered in yellow dust. Martinez's granddaughter, Glenda Rangel, still lives on the family compound just north of Prewitt, N.M. Although 350 million pounds of uranium ore eventually made its way to daylight, her family never benefited from the discovery, she says. On a windy day in March, Rangel's husband, Ernest, practices his golf putt on a rug in the living room. Her 12-year-old son, Billy, is wriggling into chaps to practice some calf roping. On either side of the family compound, two wells pump up groundwater into large, round, open tanks. 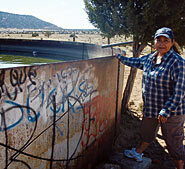 For years, the tanks have been labeled "For livestock use only," but some people in the area still haul drinking water from them. "We're told not to, but I know some people who still do because it tastes better," Rangel says. Both wells were recently tested by the DiNeh project - a partnership between the tribe, the University of New Mexico and the Southwest Research and Information Center - and were found to exceed Navajo EPA and U.S. EPA standards for uranium in human drinking water. Rangel's house got indoor plumbing in 1978, but she says, "I drank (the water) as a girl. I swam in the tanks, both me and my kids. I don't really think about it. I don't want to start thinking about it." Rangel was offered a chance to participate in a DiNeh health survey. She would have received $15 for doing so, but she declined. Still, she is troubled by questions about her family's health. "I know a couple of people who died from breast cancer around here. My older sister died of uterine cancer in her early 40s. I don't know how much exposure she got. Now, we're seeing different types of cancer in my generation. I get migraines. I can't work," she says. She peers into the clear, cool water shimmering in the glare of the high desert. The water looks inviting. "I wouldn't let my kids swim in there now."